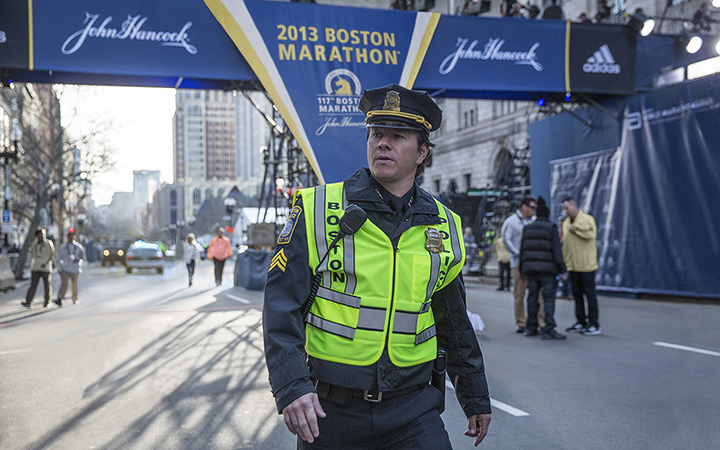 After escaping an exploding oil rig just a couple of months ago in Deepwater Horizon, Mark Wahlberg is now back on the job as Boston police officer, hobbled with a bad knee and thrust into the middle of the 2013 Boston Marathon bombings. Both Deepwater Horizon, based on the 2010 BP oil disaster in the Gulf of Mexico, and Patriots Day were directed by Peter Berg, who also worked with Wahlberg on Lone Survivor, the 2013 true-life military drama about a team of U.S. Navy SEALs on a mission to capture a notorious Taliban leader. The two Bergs seem to have a thing for real-life action sagas. An ambitious, sprawling, detailed dramatization of the events around the bombings that killed three people and injured more than 250 others at the 2013 Boston Marathon, Patriots Day takes its title from the Massachusetts state holiday on which the iconic race has been run for more than a century. 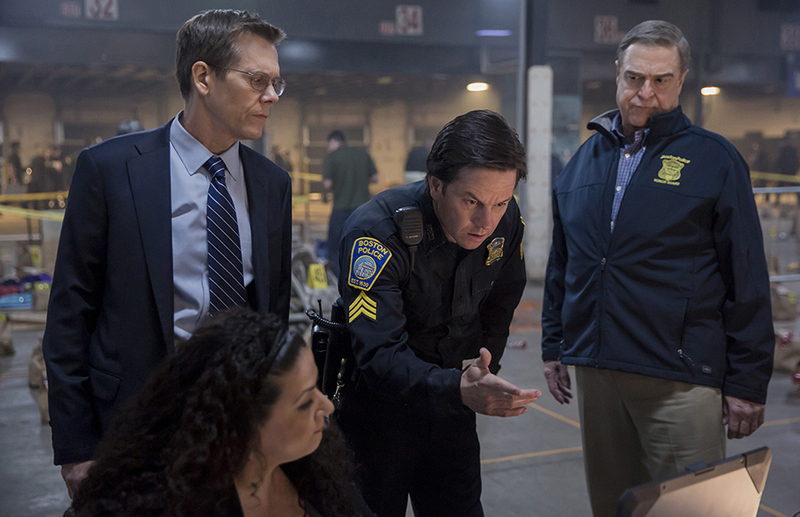 Kevin Bacon, Mark Wahlberg & John Goodman dig into the case. Walhberg gets top billing as Boston police Sgt. Tommy Saunders (a composite character based on several real individuals), who becomes key to the investigation as it becomes a citywide manhunt for the suspects. He’s surrounded by a terrific cast in a spectrum of supporting roles, including Tamerlan Tsarnaev (Termo Melikidze) and his younger brother Jahar (Alex Wolff), who carried the homemade, pressure-cooker explosives in their backpacks before leaving them in the crowd close to the marathon’s finish line. John Goodman plays Boston Police Commission Ed Davis. Kevin Bacon is FBI special agent Richard DesLauriers, who steps in when the bombing is declared an act of terrorism. J.K. Simmons hovers around the edges as Jeffrey Pugliese, the police sergeant in Watertown, outside Boston, until the fleeing suspects finally arrive there to meet their violent Waterloo. Melissa Benoist gives a chilling performance, far away from her good-girl type as TV’s Supergirl, as Tamerlan Tsarnaev’s white, Boston-born Muslim-convert girlfriend. Khandi Alexander (who played Maya Lewis on TV’s Scandal) is riveting as an “undercover” interrogator. Other, lesser-known actors portray the movie’s real heroes, like Sean Collier (Jake Picking), the MIT campus policeman who refused to let the terrorists take his service revolver, even after they’d shot him. Jimmy O. Yang (from HBO’s Silicon Valley) plays a young Chinese-immigrant college student whose path fatefully crossed with the bombers after the marathon. Rachel Broshahan (Rachel Posner on the Netflix series House of Cards) and Christopher O’Shea (Jareth Glover on TV’s Madam Secretary) portray newlywed race spectators who were both seriously injured in the explosions but survived. Their mini-story is one of the movie’s most moving, and bookends its overlay of hope, resilience and community-wide, real-life rebound. Definitely stay for the epilogue, when you’ll meet some of the real people—including Jessica and Patrick—depicted in the film. 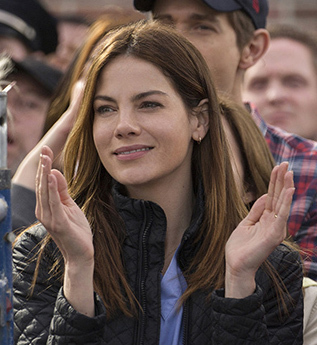 “These images in my head,” Walhberg’s character tells his wife (Michelle Monaghan) in the bombing’s horrific aftermath, “they ain’t goin’ away.” The powerful images in Patriots Day will linger with for with you for a while, too. But so will its bigger, uplifting depiction of a town and its citizens united—healing, tougher than ever and determined to not let the bad guys win—after an almost unthinkable tragedy.